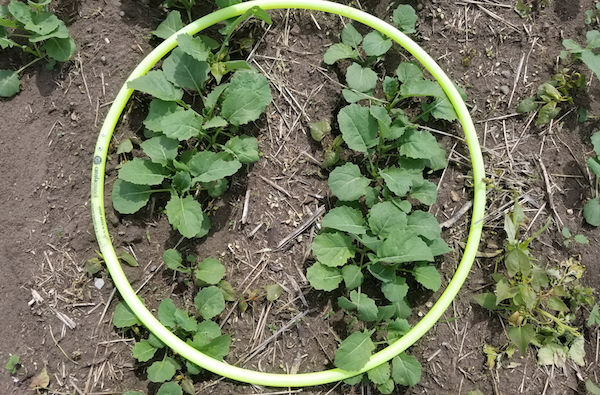 Plants are fully emerged, making it a great time to take a look at canola plant stand and decide if you’re feeling satisfied or disappointed. 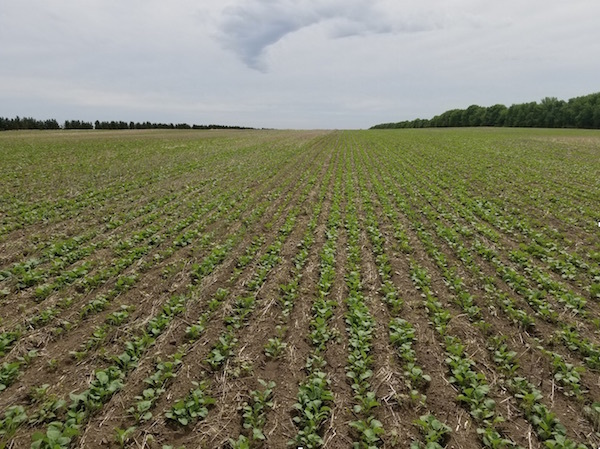 The first herbicide application is a great way to extensively “scout” fields from the sprayer, but trying to scan plants as they pass under the sprayer just gives you a rough guess at whether you could have saved money on seed? Or whether you limited yield potential by not putting enough seed in the ground? So I got off the sprayer and did a proper plant count at my sentinel field. Here’s the background for the field. Resulting seeding rate: 4.9 lb./ac. 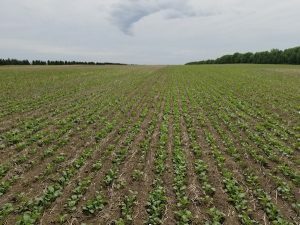 Based on the normal-dry conditions and lack of rain in the forecast at seeding, 55% survival was a good target, keeping in mind that average emergence in Western Canada is 50-60%. Using the 55% survival, TKW of 4.7g, and the targeted plants stand of 6 plants per square foot, the Canola Calculator calculated a 4.9 lb./ac. seeding rate. I did 10 plant counts using the hoop. You can also do counts by foot or metre of row. See the notes below. To get a good idea of the average actual plant stand count, I threw my hoop in 10 “typical” areas of the field, avoiding headlands, sloughs and hill tops. 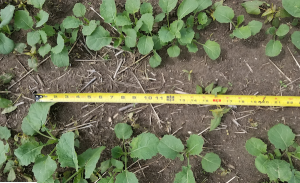 The individual plants counts were 7, 6, 7, 9, 5, 6, 7, 6, 7 and 8, showing some variability in the field. The average was 6.8 plants per square foot. Running this through the Canola Calculator, the actual field emergence was 63%. A plant stand between 6-7 plants is ideal, providing enough plants to effectively compete with weeds and could buffer a few plant losses throughout the growing season. –Ian Epp is the Canola Council of Canada agronomy specialist for Northwest Saskatchewan. Contact Ian and other CCC agronomy specialists. By length of row. Use a metre stick and count the seedlings per metre of row. Take that number and multiply by 100 then divide by the seed row spacing in cm to get plants per square metre. For example, 25 plants per metre multiplied by 100 then divided by 25 cm (10” row spacing) is 100 plants per square metre. (Divide by 10 for a rough indication of plants per square foot.) Repeat. Using hoops. To do counts, use a hoop with an inside diameter of 56 cm. This is equivalent to 0.25 of a square metre. Count the number of plants inside the hoop, and multiply by 4 to get plants per square metre. (Divide by 10 if you want plants per square foot.) Repeat.